We got home on Saturday. It was a great trip that was, as the posts hopefully indicate, blessed in so many way. Sunday was a full day and more plus we started our VBS on Monday. We were all a little nervous as we waited to see how many people would attend the lecture in Brno. The last couple of efforts were so poorly attended the guys there had about come to the conclusion that this approach had lost its usefulness. They had some optimism based on the topic they had requested. They thought a publically advertised lecture on the Dead Sea Scrolls had a good chance of success. They were correct. The turnout far exceeded anything we had imagined. In addition to the Christians, we had 20 visitors. After the lecture, they took all the material that was available and three of them stayed and visited until it was time we needed to leave the rented room. The potential for further contact is exciting and it was wonderful to see the brethren there so encouraged. We met at 10:00 to worship on Sunday. The number was good but the mood was somber. Mr Matousek has cancer. Given his age and the health care system, the prognosis doesn’t look good. Kamila was at the service with her baby. She still attends with some regularity. It was great to sing in Czech again. I was able to continue a lesson I started a couple of weeks ago. After the assembly, we went to lunch with Jan and Hana. Lucy, who had made the drive up from Slovakia joined us for a bit. After lunch, I put Nancy and the kids on a train for Prague. My evening ended with a testy discussion with another Egyptian Muslim who is busily spreading his message here in Brno. The last picture is one of a “soup kitchen”-Brno style. A difficult economy has a fundamental impact in this part of the world. This is the term Czech uses for a cookout. Saturday evening the Brno folks gathered at Joseph and Petra to grill sausages. Though it was interrupted by rain, we had a great time visiting. Jan played the guitar just a bit as additional icing on the cake. To be sure there was not problem being in Brno on Saturday morning, I traveled to Brno Friday evening. The Brno study was extremely well attended. We actually had to go find more chairs to use. As per request, I spoke on the Dead Sea Scrolls and the Bible during both the morning and afternoon schedules. I had been concerned about how well this would be received. I was very pleasantly surprised. The majority of the people who attended had traveled from 2-4 hours to be there. We traveled to Budapest on Thursday. Emese met us for supper and a visit. After the meal we took a long walk to our old neighborhood. Her spirits are good and her faith is solid. The circumstances here are difficult, but she seems to be doing the best she can with the opportunities she has. 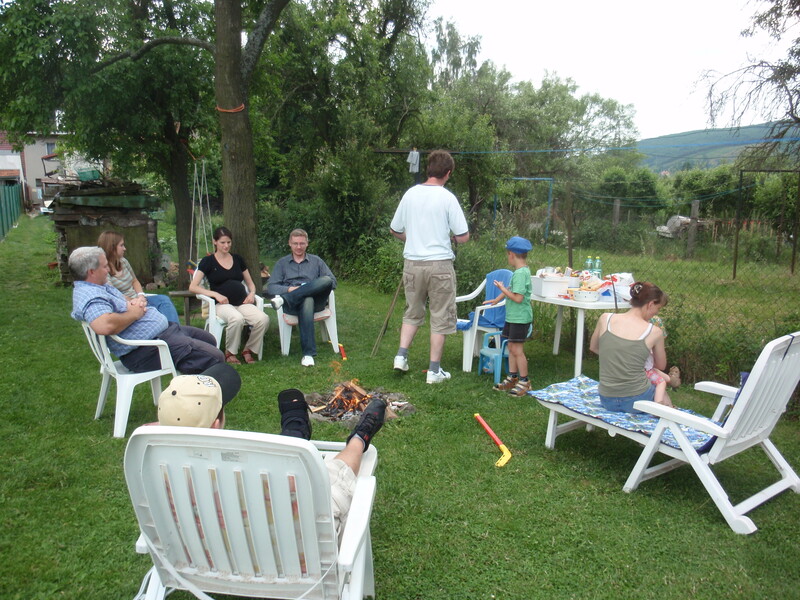 On Friday, I traveled on to Brno while Nancy and kids stayed one more night in Budapest and visited Emese again. The family arrived safely on Monday. The trip gave them a taste of the challenges of travelling with Nathan on wheelchair. Biss came over that evening for a visit. I also had a meeting with a Bulgarian who is a good friend of an old friend here in Brno. It was pleasant, but there didn’t seem to be any spiritual interest. On Tuesday, Dinyu came a spent much of the afternoon. He especially wanted to talk about his time on prison. It was heart wrenching. He also wanted help with information about western journalists in the country. He is determined to clear his name. Biss came again that night. On Wednesday, Nancy and Elizabeth visited Draga. Aaron took his afternoon to translate. As much as we have observed about the difficulties of life in countries like Bulgaria, this was a learning experience. We cannot imagine the challenges of people who are permanently in a wheelchair and live in a city like Sofia. Once again we were reminded to count our blessings.